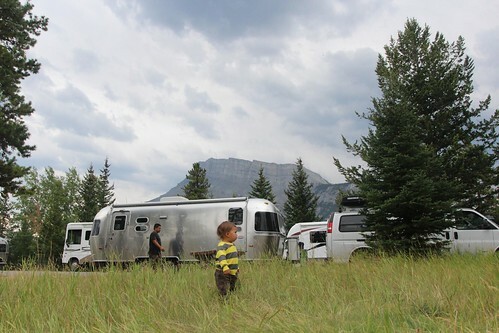 Mali Mish – Days 31-33: Our Airstream caravan to Banff National Park, Alberta, Canada. 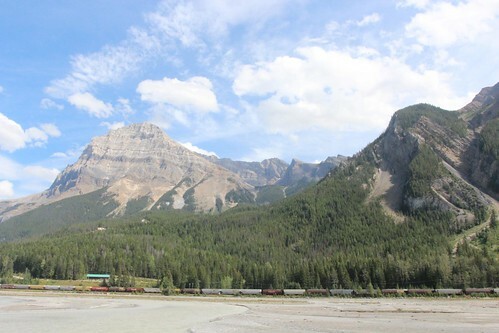 We finally made the drive to Banff National Park today. This is also the second Canadian province for us and our rally of eight will become a rally of ten during our 3-night stay here. Kyle from WhereIsKyleNow.com should already be there waiting for us at the campground. He has been traveling across Canada all the way from Newfoundland. In a day or two we will also be joined by Nathan Swartz and his family. Nathan is the creator and editor of the online traveling magazine WandrlyMagazine.com. He has been on the road on and off for many years in all forms of adventure mobiles. 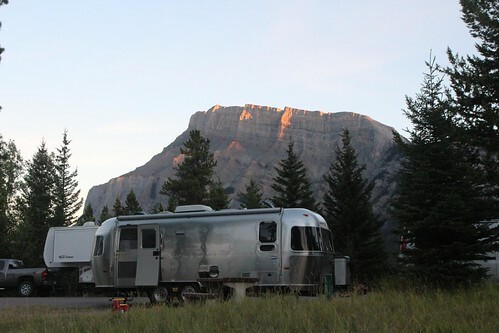 The latest reincarnation is a vintage Airstream which is the reason how he found all of us. Canada is like a more civilized version of the United States. 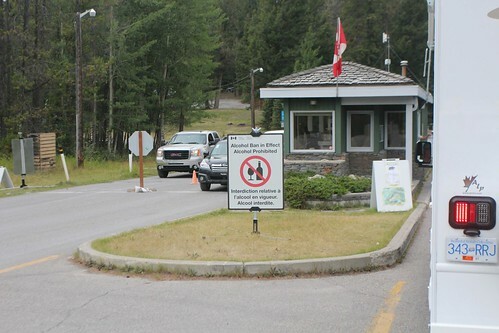 People seem to be generally more courteous and apparently their national park campgrounds ban alcoholic beverages on the weekends. We will see about that. Our reservations here have been booked for months in advance so we could all be together. That is definitely not our style but there are a few planners in our group that cannot do it any other way. It is kind of nice as this trip might not have happened at all if it wasn’t for them. We will be here a total of three nights. 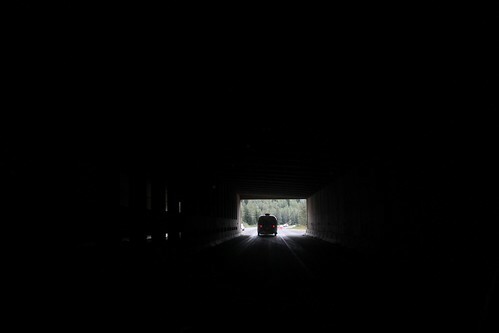 There is a lot to see and most likely we will be splitting our time with various members of the group. Luka wasted no time with his shenanigans in the trailer. He started by trying to shove grapes out through the gap beneath the aluminum screen. And look at that! Where is Kyle now? Right outside of our door. We haven’t seen this guy since the previous winter in Florida. Since then we have gone across to the west coast while he made his way to the east coast of Canada. Between the two of us, we have completely circumnavigated the entire country in the last 6 months. And finally, Nathan of Wand’rly showed up with his family. He found out about our trip in the last minute and was not able to get a reservation near our spot. 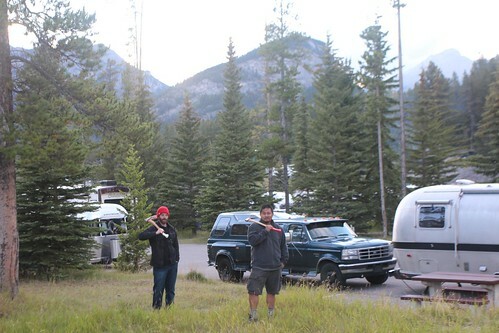 But since we actually had a couple cancel their plans without canceling their campground reservations, we ended up with an empty site right behind us. We have been following Nathan and his travels for years and it was really great to finally meet him. 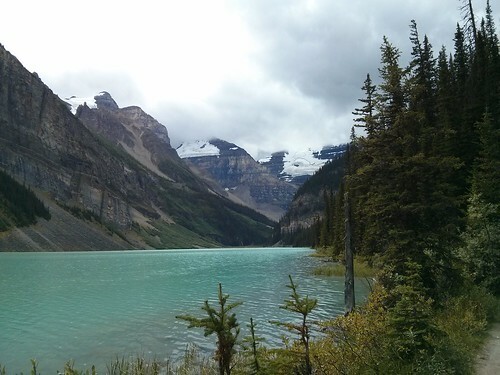 On our second day here we made the 30 minute drive east to see Lake Louise with Kyle and the Works. 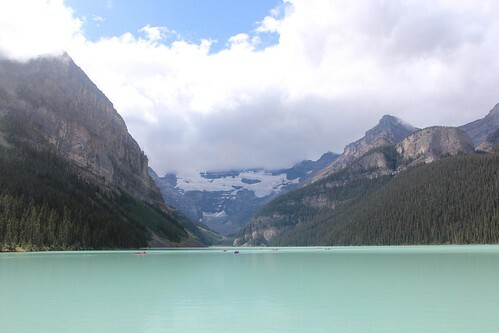 Once again, like Diablo Lake in the North Cascades, the water here is glacial runoff and it is an unbelievable aquamarine color. This is our #caughtgramming picture of Kyle. For those not on Instagram, it is a hashtag used for people caught taking pictures to post on their Instagram account. When I spell it out as I just did, it makes the hash tag sound pretty lame. Oh well. This is pretty late in the season and the glaciers on the mountain have pretty much diminished to as small as it will be all season. 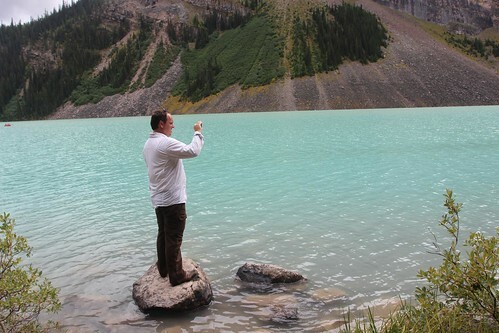 There are a couple of longer hikes here at Lake Louise that take you up to a couple of cool tea houses up in the surrounding mountains but we are not going to be making them this time around. We will have to settle for tea back at the campground. That is Democratic Traveler’s 34 ft Excella in the back. 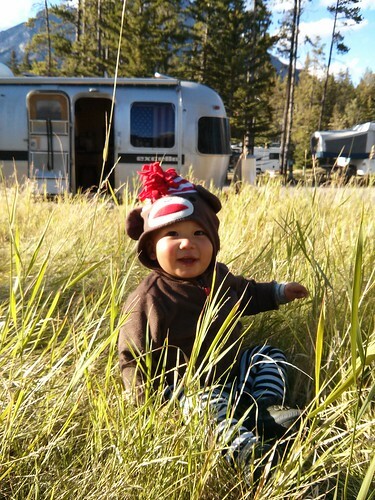 Luka is trying to sneak in there in his best monkey disguise to get a look at what all goes on in there. Jack was loving having Nathan’s oldest son Tristan around as hanging around with the girls and their ponies surely got a little boring. Josh and I took the opportunity to get in a little axe-ercise. All the wood we can burn? Sign us up! 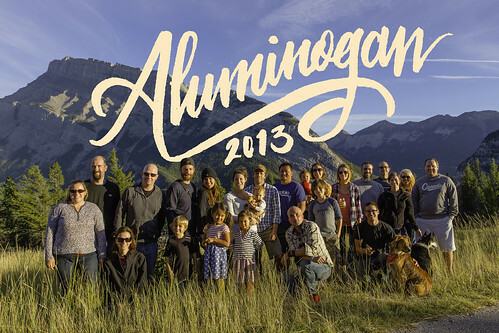 While a portion of our group when out for a fine dining experience in the town of Banff, the rest of us who have kids stayed back and had dinner together. 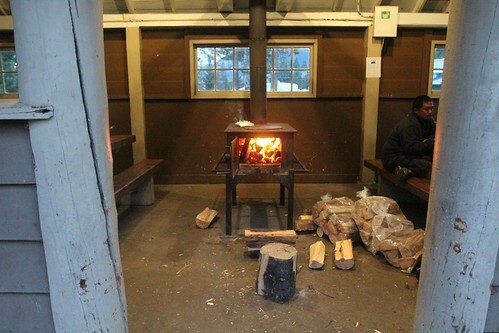 Throughout the campground at Banff, there are several of these cookhouses with a wood burning stove in the center. It kept the space toasty warm and gave us a place to cook up our food. 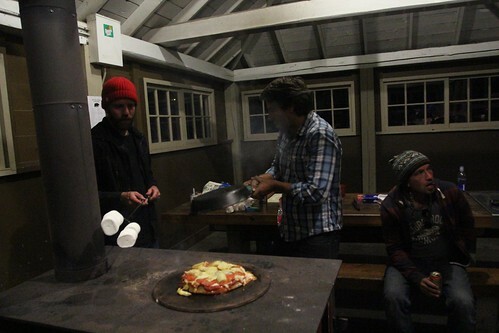 Here is David whipping up a little pizza on a stone on top of the stove while Josh and I drool over its cheesy goodness. 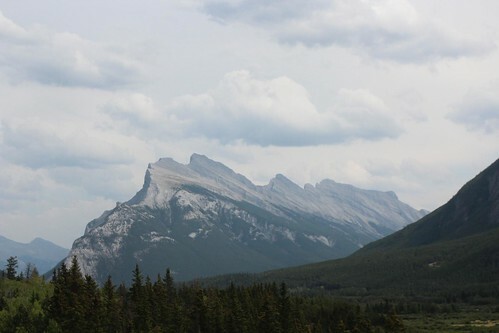 On the third day we decided to hike up a pretty popular trail called Tunnel Mountain. Ava once again did great up this moderate trail of 2.4 km. Mila and Luka of course got to ride on our backs once again. 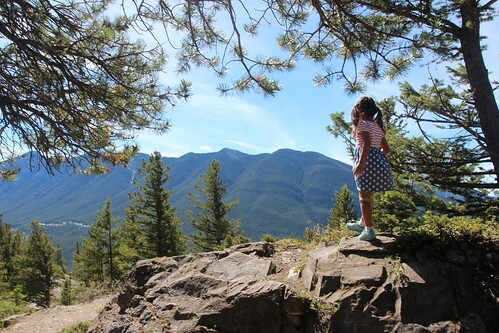 The extra weight made the hike tougher for us but the view from atop was pretty spectacular. 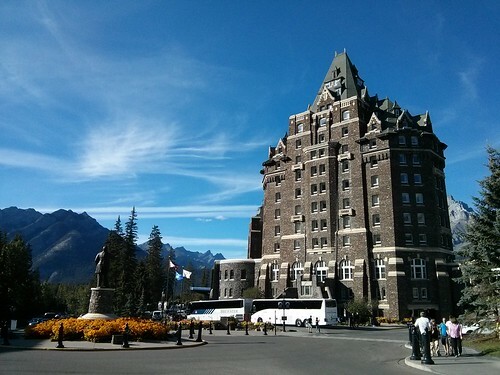 One of the places we wanted to visit was the Banff Springs Hotel. 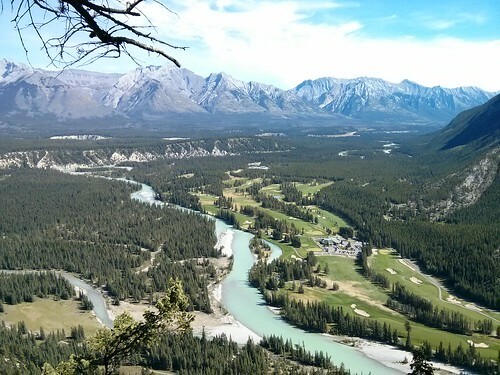 When we started mentioning our trip up to Banff on our Instagram account, we started communicating with a couple who follows our travels on the social network. Lawrence Carter, AKA @ChampCarter works as a concierge at the Banff Springs Hotel. He and his wife Kerri came to visit us at the campground the night before and invited us for a tour of the hotel. He offered to comp us free tour tickets of the hotel since he is the one who sells them and we took him up on that offer. When we got there, Lawrence was just getting off of his shift so instead of following along with a group, we got a personal tour of this 125 year old resort. 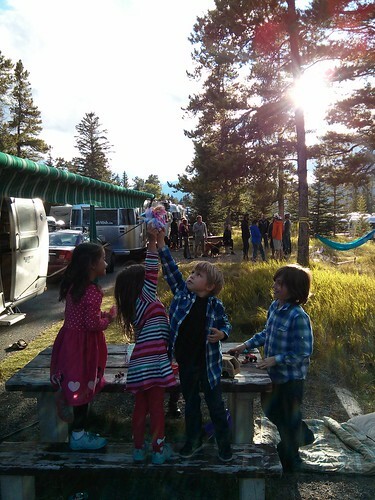 At the end of our last night’s stay here in Banff, the group will be splintering off onto separate adventures. A handful of us are heading north for a few more days in Canada to Jasper while others are heading back into the United States. 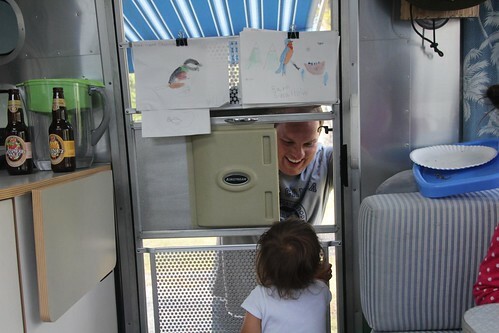 We will be making our way down into Idaho to have a little birthday party for Mila who will be turning four. She has had a little more hiking than she can handle so we will have some kid friendly activities in the forecast. We plan to meet up with some others in the group in Montana in a week or so once we check Idaho off of our list. This trip up to Canada has been amazing and we are really glad to have made the time to come up here. It was not an easy trip to organize and I’m really glad everyone who attended made time to do it with us. 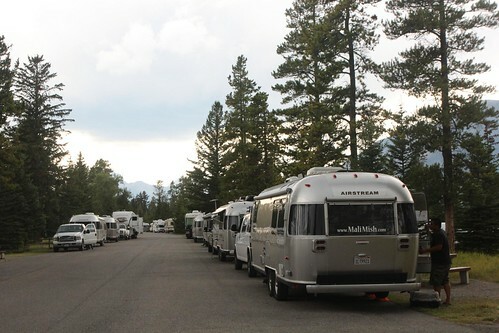 Our traveling neighborhood of full time Airstreamers became literal for the last couple of weeks and we look forward to many more rendezvous to come with each of them in the future. 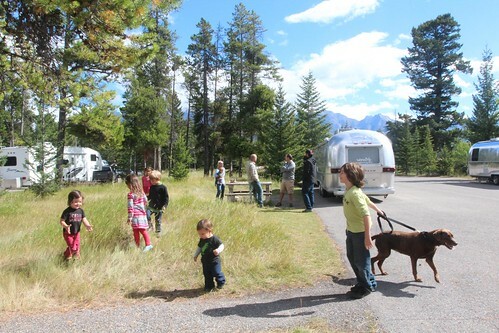 3 Responses to Days 31-33: Our Airstream caravan to Banff National Park, Alberta, Canada. Great times they were! It was so nice to meet so many likeminded people and new faces for the kids to hang with. Hope to see you somewhere south when we finally escape Oregon! That looks like an amazing journey. That is the kind of caravan I want to be a part of. The next time something like that goes down, count us in. I may need a lot of advance notice. I don’t care if I have to airlift my Airstream. I would love to hang with that crew. Great pictures too.